A Colon Cleanse is a great way to clean out your system, eliminate parasites, deal with constipation, or just improve your digestive health. 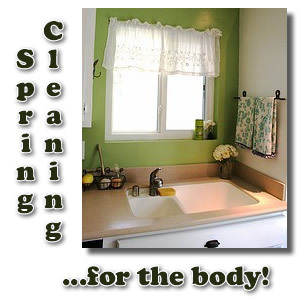 Consider it spring cleaning for your body! Have you ever noticed that every now and then your kitchen sink starts to give off a bit of an odor? You get a whiff of a nasty smell and wonder what in the world rotted or died. It turns out the smell is coming from the drain in your sink. It doesn't really make sense. After all, you use soapy water to wash the dishes. You wash your hands with soap and follow all that up with a good rinse. Why does it stink? In spite of all the cleaning fluids that go down your drain, grease, food particles, dirt, etc. still cling to the walls of the pipes on their way out to the sewer or septic tank. Over time this builds up and starts to rot. Then you start to smell it! Cleansing your colon is the place to start spring cleaning your body. 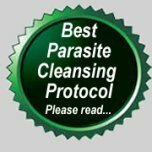 Remove parasites, built up waste, toxins, candida, and more with a good herbal cleanse. Perhaps your water starts to drain a little slower, or it might even stop draining completely if matters aren't dealt with swiftly. You realize it is time to run something down that drain that will clean out all that built up gunk and get things flowing smoothly again! You might use vinegar and baking soda, perhaps a bit of bleach, or even a commercial drain cleaner if the situation calls for drastic measures. Whatever your solution, you take action! Your body can be a lot like your kitchen sink! You are constantly putting things in your mouth (well, at least I am), and eliminating the leftovers out the other end. 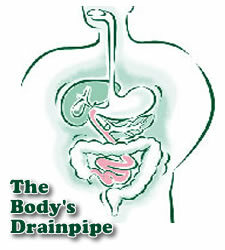 Your drainpipe (the digestive system) sometimes gets a bit clogged. Bits of undigested food and drink cling to the walls of your colon and eventually start to decay and rot. 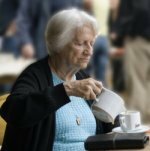 As a result, you may end up with constipation, diarrhea, irritable bowel, or even health problems that seem completely unrelated to the digestive system. You could have aching joints, headaches, fatigue, or other symptoms of a clogged colon. When that happens, you know it is time to think about cleansing the colon. A good bowel cleanse will remove the build up and allow your digestive system to start working properly again. You'll get more nutrients out of your food and increase the amount of waste you pass more naturally and easily since your "pipes" are clean. If you have never done a "spring clean" of your body before, I would recommend you start with a colon cleanse that is made up of a blend of herbs and fiber. 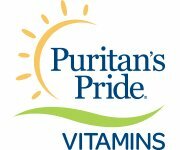 The fiber will help you eliminate more efficiently and easily. The right herbs will break down the build up from the intestinal walls and kill any lingering parasites that may have taken up residence in your digestive tract. The product I personally use is Herbal Fiberblend. Just like at home, once you have completed a spring clean, it is a lot easier to keep things that way with gentle regular cleaning. That's when you should take into consideration natural colon cleansing principles. A natural colon cleanse incorporates your body's natural rhythms. If you can train yourself to eat according to these patterns, you won't have to do a "big clean" colon cleanse as often in the future. Some people think cleansing the colon is silly and unnecessary. Well, I'd hate to see the state of their kitchen sink! Click the links below to see the questions and contributions from other visitors to this page.